Today's tune is the fourth of Johannes Brahms's Hungarian Dances (Ungarische Tänze in German), a set of 21 lively dance tunes based on Hungarian themes. Even if originally written for piano four-hands, each dance has been arranged for a wide variety of instruments and ensembles. 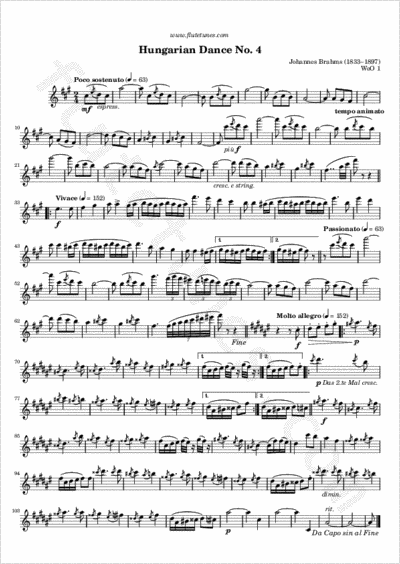 Our arrangement for solo flute is in the key of F-sharp minor, like the version for orchestra by Brahms himself; the original version for piano four-hands, however, is in F minor. Be careful in the central part of the piece (“Molto allegro”), where it switches to F-sharp major, as there are many double sharps! Thanks to Samaa for suggesting this piece!